DCM Classics has been working close with MOPAR to reproduce more officially licensed Emblems. After our success with the POWER WAGON logos, we are moving on to phase two. Our goal is to recreate high quality parts that simply don’t exist anymore. 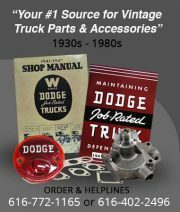 This entry was posted in DCM Classics, Product and tagged Dodge, Emblem, Job Rated, Job Rated Truck, plymouth, Plymouth truck. Bookmark the permalink. 5 Responses to Exciting News! More Officially Licensed by MOPAR Emblems! Also looking for reproduced Fargo badges. I see that DCM is in the process of getting new Power Wagon emblems made up. Do see any thing in the future for Fargo emblems. We currently have them with our engineer to be drafted, then a sample has to be made and approved by MOPAR, then production will begin. (We are officially licensed by MOPAR for reproductions) We just started this process – but it is started. Watch the blog and our social media, we will make sure people know when they are completed.